You read that right! From August 2018 to March 2019, CFCC recycled 242 pounds of batteries! Since we started battery recycling in Fall 2014, CFCC has recycled a grand total of 1,054 pounds. 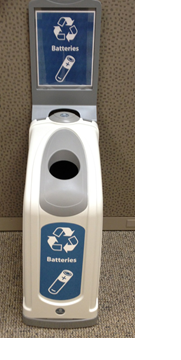 We have just added two new battery recycling fixtures–one by the Port City Java in Union Station and one in the hallway of the NE building at North Campus. You can find battery recycling fixtures in both the Wilmington Campus and North Campus Libraries, S-building second floor lobby, A-building second floor lobby, beside the Studio Theater in the Wilson Center, and in the hallway of the NB building at North Campus. So, got some batteries rolling around in a desk drawer? Drop them off and keep them out of the landfill!